As we talked about in the stage 1 journal post, cycling is often reduced to numbers. The second stage of the Transpyr 2017 backroads brought us back to the human element. Here is the story from a 7 day randonnee across the back bones of the Pyrenees on a WOOCA bike. Day two was not plagued by the same relentless heat as on day 1, but it was the first real mountain stage of an event that is really a mountain epic. Following the backbone of the Pyrenees and crossing Spain from the Mediterranean to the bay of Biscay is bound to be a challenge with its share of climbs, but it is first when the slow monotonous rhythm of a real uphill climb finds its way into your legs that one really begins to understand how much hard work goes into such an achievement. Stage two ushered the riders through the Northern mountains of Catalonia punishing them with climbs of up to 20% in grade. The first day may have worn them down with torturous heat but this stage put them to work at the order of the day – crossing over 150 kilometers of mountains. Sergio was in fine spirits at the start in the morning despite a clear sense of expectation in the air. Everyone at the start was aware that the day ahead would bring more climbing than the day before and the 3150 meters of climbing would challenge even the most seasoned of climbers. The thought of meeting the same heat as the day before was also a threat that no one really wanted to think about. Fortunately the start was cool and enjoyable and the entire entourage rolled out of Campedron with a sober and determined pace. There was a sense of solidarity in the air. We caught up with the riders just prior to the most devastating climbs. To be honest we made a wrong turn and didn’t get to see them on the worst couple of kilometers but other wise we kept on their track and tried to keep our finger on the pulse – everyone seemed very determined and in good spirits. We drove on and met the group for the second supply stop and watched them roll in. Sergio lead his pack into the depot and he seemed like he was in good spirits – there were only two significant climbs ahead and the stage was to end up with a 30 km downhill that probably sounded like a chilling but enticing reward for the end of the day. The truth would prove itself otherwise. The talk and chatting at the depot stop was evidence of the camaraderie that was forming in the group – we couldn’t help but notice that Sergio has been dubbed “Gallego” by his fellow riders which is natural since he is the only competitor from Galicia. At the end of the day we debriefed over a bottle of beer and were proudly informed that the Coh&Co Gustav frame is solid as a rock on highspeed decents – unfortunately Sergios computer crashed at the finishline so there is no temperature, speed or altitude noted for the day. The total ride was around 150 km with 3150 meters of altitude gain, his ride time was 7 hrs and 15 minutes. Seen from the support vehicle the roads and scenery were breathtaking, but the final decent must have been bone shattering. The road lead through a portion of the Parc Natural del Cadi Moixero… spectacular beauty with horrible tarmac! Stage three offered a shorter day but there was a lot of climbing and with only 137 kilometers and 2924 meters of altitude gain it was a trial. The grade never reached the extremes of the second stage but it did wear on for kilometer after kilometer. There was a pretty laidback start, Sergio set out in a group with some of the other riders and they had a nice roll through the Catalonian countryside and after about ten kilometers they put their noses to the grindstone and began a serious 25 kilometer climb with cup to 11,5% inclination and a 1105 meter altitude gain. This push brought them through the first and most treturouse of the days 5 mountain passes. Sergio kept his form and made his way up through the pack. At the top everyone regrouped a bit and made off downhill in a little group of five riders. The decent was a long breathtaking 20km ride. At the bottom everyone stopped but Sergio pressed on. The second climb was quite tough with a 3km climb of 10% and a max gradient of 14,4%. 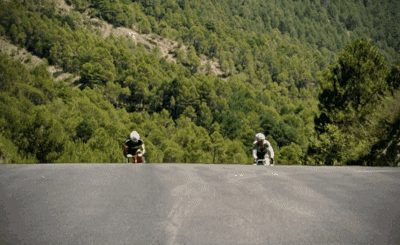 After 20 kilometers of free riding a climb like this is like hitting a wall. The only saving grace on this part of the ride was the beauty of the scenery and the snowcapped peaks to the North. There must have been solace in knowing that the first refreshment stop was at the top. The next portion of the trip was sort of a plateau with moderate descents leading to the third climb. A gorgeous narrow road with lots of tight switchbacks lead up the 10,5 kilometer climb with a 4,6% gradient. The backside offered a coast with a beautiful view over the valley and an eye towards the final pitstop of the day. Right after the second stop the assent of the final two “double” mountain pass. The combined stretch offered 15,2 kilometers of riding with a maximum grade of 10,9% and and average inclination of 4,5%. The final descent was a 15 kilometer roll into El Pont De Suert. Sergio was feeling strong after the ride and gave his Gustav a nice washing to rinse off three days of roadgrime. Sergio, who has never felt really comfortable pushing speeds on rollerblade descents, announced proudly that his day had produced a new Coh&Co speed record of 65,9 km/hr and he was very confident in the bike on the downhills. He finished the stage in 6 hrs and 39 minutes with an average speed of 20,6 km/hr. Stage four brought us 137 kilometers from Catalan to Ainsa in the province of Aragon. This was some of the most beautiful mountain scenery one could imagine. Sergio and Gustav started their day with a bit of lead in the legs. The first 10 kilometers were pretty easy but it was hard to get in the swing of things. When Sergio reached the climb he and the bike got together to make it happen again. The first of the days five climbs was an 8,5 kilometer climb up a very narrow road. It was quite frightening because the road was so narrow and steep that cars could not pass the riders without somebody stopping and pulling off to the side. Having said this it was incredibly breathtaking scenery. The backside had its rewards. There was a wide open road and Gustav and rider smashed their own speed record with a heart stopping 73,8km/hr. At the bottom of the hill, just before the first pitstop, Sergio was stopped by the police for swiping the screen of his GPS. It sounds like they thought he was using a mobile phone but they finally backed down and let him off with a warning. After a quick break after being stopped the road went through a VERY NARROW canyon called Congosto de Obarra. The canyon was only meters wide and there were tunnels along the northern side of the route with holes in the tunnel walls where one could see the landscape. It was really impressive to see. After the first break there was a mild 40 kilometer long descent through open valley and countryside. Sergio kept with a peloton of about ten guys for this part of the stage. The group broke up when they hit the next climb which was the third of the day. This climb pitted the riders against a 13 kilometer 644 meter climb with a maximum grade of 14% and an average of 4,9%. Sergio climbed this one alone. Just over the top there was a stop for the second organized pitstop of the day. After lunch there was another 25 kilometer descent which steepened at the end. Sergio and steed managed to break their own record yet again – this time with a 73,8km top speed towards the end of the run. Then there was a couple of kilometers of riding on a pretty large main road until the riders were lead off onto the final climb of the day up a very spectacular narrow road. The climb started with a 10,7% grade and then eased off to result in an average of 4%. The landscape was a sort of high mountain dessert with grey sand and rock formations. After this final climb there was a rollercoaster like descent with lots of short ups and downs. The stage ended with a steep climb up into the Citadel at the top of the mountain at Ainsa. The finish line itself was in the old fortification walls of the castle. We debriefed with Sergio at the end of the day with a beer at a cafe in the old part of the town and then he went off to wash his clothes and get ready for the next day. Stage Five began from the same finish line that it left off from the evening before. After descending from the starting line at the Castle the peloton broke up and everyone found their own groove. The road took the riders Northwards along a river at the valley floor. After about 15 kilometers they hit the first of the days 5 passes. This was a 23 kilometer climb with a 10,4% maximum grade and 3,4% averrage. The road was wide large and their were allot of cars which made the ride tedious and long. Sergio ws feeling strong and had joined his new friends – a group he had been riding with on and off all week. After a relatively nondescript descent there was a pitstop for a bite at the 50 kilometer mark. Immediately after the stop the riders set out onto the second big climb at gorgeous ascent up a 518 meter climb that lasted 13 kilometers with a manageable average gradient of 4,0% and a maximum of 7%. There were lots of tight switchbacks on a very open and treeless landscape that afforded the riders allot of contact with each other – one could see the riders ahead and behind on the mountain as everyone climbed their way up. There was a nice rollercoaster descent on the backside down into the town. Which offered an opportunity for a stop for a coke that wasn’t on the program. This opened the door for an easy 10 kilometer roll through a wide valley to the second official pitstop. This stop was at a gorgeous old church in a little village. Immediately after the stop there was a little climb that didn’t register much in the statistics but the 260 meter climb right after break was arduous and felt much longer than it actually was. After wards there was a 16 kilometer run to boost the spirits of the group. Sergio lost the group at the bottom of the last climb while stopping to replenish his water supply. He tried to catch them but it really beat up on his reserves. The climb was 13 kilometers and had an average grade of 2,5% and a maximum of 8,2%. 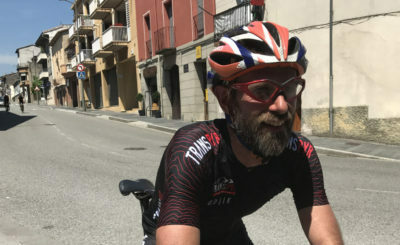 He ended up doing the climb alone and finished the day with a rollercoaster descent on his own to the finish line at the central square in the town of Jaca. The day finished off with a visit to McDonalds and beer at a bodega. This stage is the pinnacle of the event – the longest day with the most greatest amount of climbing – after 5 days the riders are becoming seasoned but also aware that they are a bit worn. For Sergio this was not the best of days. In the morning he was looking a bit pale and tired before the start. He later confided with us that he had fought with a bout of dysentery and that made the 3256 meters of climbing through the 9 mountain passes to Burguete in a summer heatwave even more difficult than it otherwise would be. He completed the stage nonetheless and was even feeling better and had a glass of wine and some chorizo with us at our daily debrief after the run. Sergio told us that he was feeling better toward the end of the day. The biggest climb of the day was the fifth mountain pass up to the top of Larrau pass. It tested the riders with 695 meters of ascent on a 10,8 kilometer stretch with a 6,4% average grade. It was on the backside of this climb that there was a steep descent that had some bigger more open turns and allowed the riders to open up. This is where Sergio hit the top speed of the entire trip topping off at 81,7 kilometers/ hr. It made a great impression when he, despite having been ill all day, told us that he really appreciated how stable his Gustav road bike frame was on decent and difficult terrain. 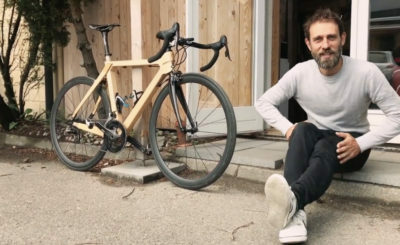 He also told us that he was really impressed that despite 6 days of strenuous riding he wasn’t experiencing any of his usual backpain – considering we were very adamant about setting the bike up to emulate his previous carbonfiber steed – this must be due to the unusualy smooth ride and vibration absorption offered by the wood and carbon construction of his Gustav. The final kilometers were also plagued by a strong headwind and despite the complaints of many of the riders Sergio and Gustav ate it up. He said he felt like the bike was keeping speed and just asking for more despite the winds. The final stage of the Transpyr was maybe the prettiest. Although many said it would be the easiest, it was not without its challenges. None the less it was dominated by the confidence that comes from knowing that the worst is behind, and that gave room to enjoy the unusual scenery and narrow roadways. This stage took the riders through 149,2 Kilometers of countryside and mountainous pastures capped by an invigorating 28 km decent at the end. There was an even bigger descent of around 45 kilometers between the two pit stops of the day. The route meandered along and across the French Basque border, much of it on frighteningly narrow mountain roads that weren’t wide enough for a car to pass (or be passed by) a bicycle. The first couple of climbs brought the riders up to 962 meters above sea level. And over a mountain pass leading into the Basque region of France. The ensuing descent into the valley bellow was gorgeous but must have been hair-raising for the riders. Hairpins were tighter than we saw through the entire journey and although the road was in fine shape its narrowness and constant winding must have kept every rider on his/her toes. Sergio was with a group for the first two climbs but struck out on his own for the later part of the day. The third ascent made its point with a 531 meter climb that peeked out at 19,0% of gradient! Riders finished off and concluded their adventure with a ceremony at the harbour front in Hondarribia. The Bay of Biscay was a welcome sight. Many of the riders packed their bikes immediately and turned themselves towards returning to their daily lives. I am sure they all will carry a memory of the 2017 Transpyr with them for many years to come. 7 days of beautiful scenery adventure and comraderi are ingredients for impressions that last a life time. 149,2 km, 2276 meters, 6 hrs and 32 minutes, 22,8km average, top speed 73,8km hr.